Posted on Thu, Apr 12, 2012 : 3:53 p.m.
Come out to the "Annual Braylon Edwards Celebrity Basketball Game" at Pioneer High School on Friday. Doors open at 7 p.m. Last year saw players from the Kansas City Chiefs, Philadelphia Eagles, Cleveland Cavaliers, the Detroit Pistons and more. They expect big stars again this year. The game benefits U-M researchers racing toward a treatment for ALS. $20 adult, $15 student. Special VIP courtside passes are available for $100. For tickets, visit www.BraylonEdwards.com. Pioneer is at 601 W. Stadium Blvd., Ann Arbor. 734-994-2120. Mr. B and his piano return to the Ark on Saturday and Sunday. Be sure to catch "Mr. B’s Piano Celebration" at the Ark on Saturday and Sunday. 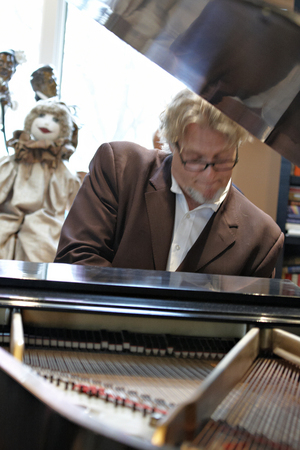 7:30 p.m. Once a year, Ann Arbor's own wizard of blues and boogie piano music comes together with other top piano players from around southeastern Michigan and beyond. This year's show includes both musical and visual components as three pianists and an artist join forces with images of pianists shown at the Ark. $25. The Ark is at 316 S. Main St., Ann Arbor. 734-761-1800. The Charles Lloyd New Quartet will play at the Michigan Theater on Saturday. 8 p.m. Forty years ago, saxophonist Charles Lloyd was a pop star; his 1966 album, "Forest Flower," sold a million copies. Lloyd has always led exceptional bands, and this is perhaps the best. $18-$44. The Michigan is at 603 E. Liberty St., Ann Arbor. 734-668-8397. Support the Ann Arbor Derby Dimes and the FLY Children Art's Center at the "Whip Stitch Art and Craft Fair" on Sunday at the Corner Brewery. 2-10 p.m. Find cool, one-of-a-kind crafts and gifts at this craft fair, which helps support two great local groups. No cost to attend. The Corner Brewery is at 720 Norris St., Ypsilanti. 734-480-2739. U-M Outdoor Adventures will present the "Banff Mountain Film Festival World Tour" at the Michigan Theater on Sunday. 7 p.m. From an exploration of remote landscapes and mountain cultures to adrenaline-fueled action sports, films in this year’s world tour are sure to captivate and amaze the explorer within you. $15 ($10 for UM students) in advance. $17 ($12 for UM students) at the door. The Michigan is at 603 E. Liberty St., Ann Arbor. 734-668-8397.